During the 36th week of my pregnancy, the OB noticed a problem with my baby, so he did an ultrasound and immediately referred us to a specialist. The specialist told us that Nathan had severe holoprosencephaly, and that it wasn’t likely that he would survive his birth. If he survived, he told us he would be a vegetable and not have a meaningful life. We asked for people to pray for our baby, and many many people helped by praying, offering support, and many others by giving us donations to help with all the hospital bills. The outpouring of support and kindness was insurmountable. Well Nathan not only survived his birth, but didn’t need any assistance and was able to come home with us after a few days. We investigated some statistics and found that Nathan’s chance of surviving full-term gestation, birth, and out of the womb are 1 in 20 million. 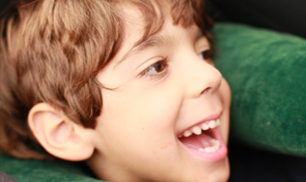 of events that led to his brain malformations. The chance of Nathan having a sibling with HPE is very very slim, less than 10%. At 3 months we had an MRI and they confirmed the diagnosis, as well as an additional diagnosis of Hydrocephalus. 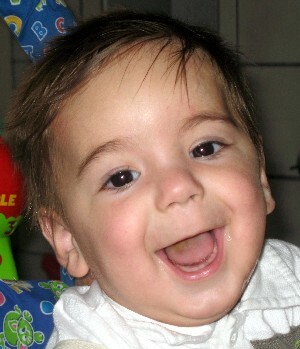 He had a surgery for a VP shunt in November 2006. Unfortunately his shunt got infected and had to be revised in January of 2007. He was in the intensive care unit for 23 days. Other than that, Nathan is doing very very well. He is a delightful child, he is very curious and aware of everything around him. He loves to play and to move around and his favorite thing is to go out and people-watch. He enjoys having baths and getting massages. He quickly figured out how to get his way, so now he has many servants doing his bidding at all times – and we all love it. He is very very sweet and loves to smile and babble and is incredibly expressive. We do not know what the future holds for Nathan. The doctors are very impressed with how well he is doing so far, but they are not sure if he will be able to walk, talk, learn, or control his movements. We have stopped asking about his prognosis as it is now obvious that he will show us what he can do in due time. We are certain that Nathan is doing so well due to everyone’s prayers and support, and we are so very grateful. We ask that you continue to keep Nathan in your prayers so he may continue to be happy and so he may continue to grow and develop. Please Pray for his life and health. We appreciate it very much.